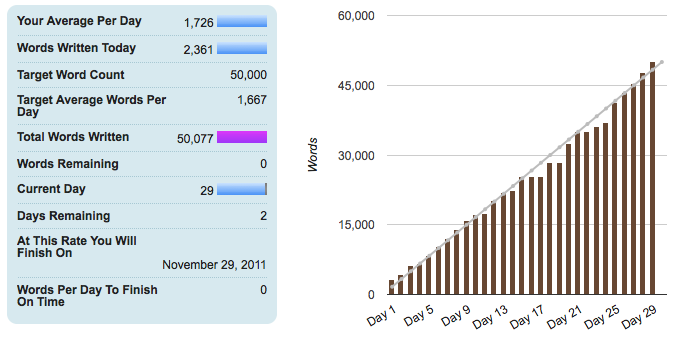 At 50,077 words I finished my NaNoWriMo novel THE HERO, or THE KNIGHT WITH THE SWAN. “Is that my ward, Mellayne? Who ran away at the beginning of summer? Why, whatever has gotten into you? You used to be such a quiet child,” said the queen. She snapped her fingers. Mellayne gasped and one hand clutched her throat. She bent over, making choking noises. “Your quarrel is not with Mellayne! Let her be!” commanded Lukas. Instantly Mellayne stopped choking, but no sound came out of her mouth when she opened it. She leaned against his back, trembling, and gave a great sob. Mellayne tried to hold him back, but Lukas dismounted. He drew his sword, the one given to him by the Mistress of the Night. They started to circle each other. “I will fight you, false traitor, for you have enslaved my people,” he said. Did Lukas defeat the Queen of Marschon? Did he survive his battle with the basilisk? Well, you will just have to find out. But I still won, because after a few days of resting the creative well would be refilled, and I would write up a storm. This is my sixth NaNoWriMo and my ninth WriMo since 2003. Since 2009, I have written four novels. More importantly to me, I have successfully written a four-book series, with interesting and different characters and stories in each. I’m quite pleased, if I may say so myself. Now, something just as exciting in my point of view: because I finished NaNoWriMo today, and because tomorrow is a university holiday, I am taking the rest of the week OFF. Sleep, glorious sleep! You did it! I’m going to read the second half tomorrow between teaching to figure out whether Lukas defeated the queen.